Cellardoor Magazine: Trick or Treat? Of course it's a treat... and we've picked our favourite spooky treats for you to try. These cakes may look pretty gruesome but they taste utterly gorgeous. - Preheat the oven to 180C/160C (fan)/gas 4 and line a 12-hole muffin tray or 3 x 12-hole mini muffin trays with cupcake cases. - In a large mixing bowl, cream the butter and sugar until the mixture is pale and smooth. Add the eggs, one at a time, mixing for a few minutes after each addition. - In a separate bowl, combine the two flours. Put the milk into a jug and add the vanilla extract. Add one third of the flour to the creamed mixture and beat well. Pour in one third of the milk and beat again. Repeat these steps until all the flour and milk have been added. 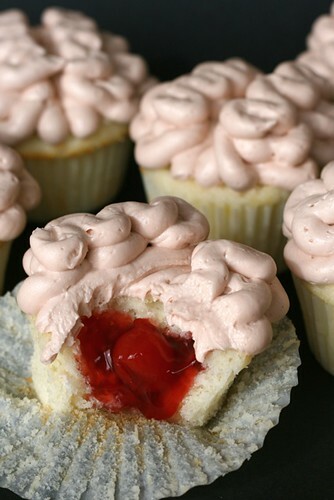 - Spoon the mixture into the cupcake cases, filling them to about two thirds full. Bake in the oven for about 25 minutes (regular size) or 15 minutes (mini size) until slightly raised and golden brown. To check they are cooked, insert a skewer in the centre of one of the cakes - it should come out clean. - When completely cold, cut a smallish hole into the top of each cake. Spoon no more than a teaspoon of jam into the hole forming a gross “blood clot” inside your cake. The cakes are then ready to place brains on top. - In a large mixing bowl beat the butter, milk, vanilla extract and half the icing sugar until smooth. Use an electric hand mixer to make life so much easier. Gradually add the remainder of the icing sugar and beat again until the buttercream is smooth and creamy. - Using an icing bag with a circular tip, squiggle on top to help get the look of a brain, try to decorate in two halves to give the look of hemispheres, try to give it a domed shape, and make the sides as symmetrical as possible. If you are feeling adventurous add a few blood vessels using red decorating gel. These cute little hot dogs in pastry make for an easy spooky treat. Just wrap some sausages in some ready made pasty. See recipe here. I wish I'd had the motivation for making some halloween treats this year! Gingerbread bats are my favourite thing to make! i want the cupcakes they look tasty!